Is she or isn't she? (Running for president, that is.) After months of Hillary Clinton not really answering the question on everyone's minds, Americans can finally expect to hear an answer. 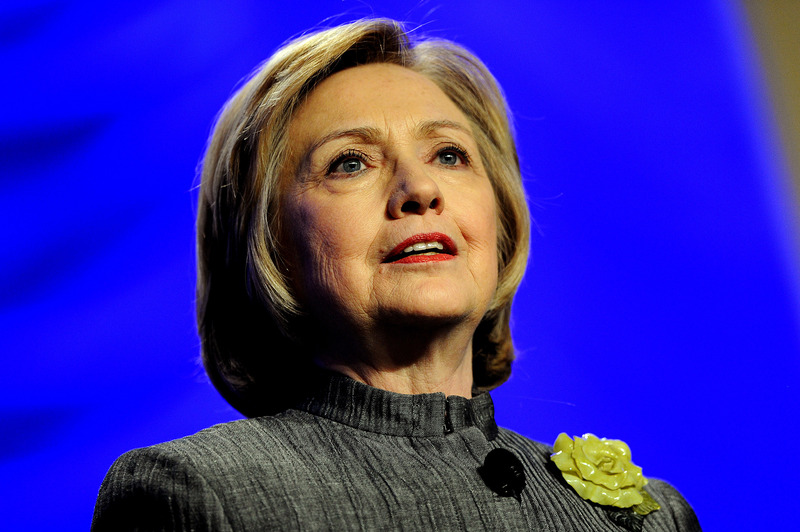 Reportedly, Hillary Clinton will announce her run for presidency in the 2016 election on Sunday, April 12. It has been a been a topic of heavy speculation for a long time. In fact, people were talking about the concept of Clinton trying a 2016 run not long after current President Barack Obama was reelected back in 2012. It makes sense, especially since she did try to run for the position back in 2008 and was actually considered by many to be the frontrunner for the Democratic ticket before Obama entered the race. Of course, Clinton already continues to have a large and loyal following of supporters who are ready for her to take charge of the White House. And her fans come from a variety of walks of life, some being celebrities. And it looks like Clinton has already pulled in a decent amount of nods from Hollywood. Check out the round up below to see which celebrities have already vouched for Clinton in the past, and see if any of the names surprise you! Nicholson announced his support for Hillary Clinton way back when she was running in the 2008 election on the Rick Dees morning radio show in Los Angeles. He also filmed a video endorsement praising her experience and saying, "I was raised by women. I know how tough they are when the tough gets going." Portman opened up to Elle about Clinton and her frustrations with sexist comments made against her during her 2008 run. "She's so much more polished and experienced than anyone else," she told the magazine. Longoria is such a fan of Clinton that she started endorsing her for president in the 2016 run in 2013 — as long as that is what Clinton wanted to do. Goldberg made headlines when she publicly changed her endorsement for Obama to Clinton back in 2008 on The View. What made her change her mind? Clinton's promise that she would end tax breaks for companies that ship jobs overseas. If it was up to Cher, the 2008 election would have gone a lot differently. In a video interview with ABC News, she made her choice for the president crystal clear. Lady Gaga's BFF put his singing talents on display for a Hillary Clinton fundraiser. He has also been seen palling around with former President Bill Clinton. Everyone's favorite hat wearer endorsed Clinton in a 2014 interview with GQ magazine, saying,"She's gonna win!" for the 2016 bid, even though she was still playing coy about whether she was even running. The celebrity cook and television personality joined several other entertainers in endorsing Clinton for her 2008 run. Streisand, who has been a longtime Clinton fan, was a noted donator in Clinton's first White House run. "Madame President of the United States ... it's an extraordinary thought," she said in a statement released by Clinton's campaign. "Hillary Clinton has already proven to a generation of women that there are no limits for success."